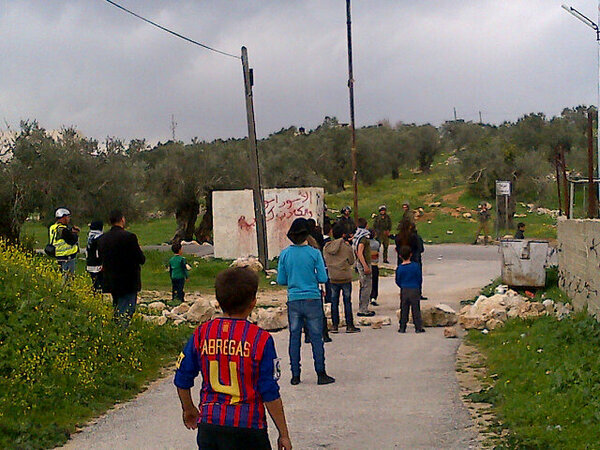 For five years now, residents of Nabi Saleh have been denied access to their spring. A source of irrigation for their crops, as well as a place for recreation: al-Qaws spring was the heart of this farming community. The illegal settlement of Halamish was established on the land of Nabi Saleh, and the neighbouring village of Deir Nidham in 1977; since then, and particularly in recent years, the settlement has been growing, stealing more land, and finally denying the villagers access to their spring. For five years, every Friday, residents of Nabi Saleh gather with local supporters, Israeli and international activists, to protest against the theft of their land and the denial of access to the spring. Sometimes, with bravery and determination alone, these villagers have managed to reach the spring, stealing a few precious moments before the arrests and reprisals reach their climax. Most of the time, the repression from the Israeli Occupation Forces is too great to get anywhere close. Today in Nabi Saleh the villagers gathered at the petrol station on the edge of the village; undeterred by the rain, they were ready for the weekly demonstration. The weekly show of strength and determination to fight for what is rightfully theirs. We walked down the road, men, women, and children chanting in Arabic and English, voicing our common determination to end this occupation. 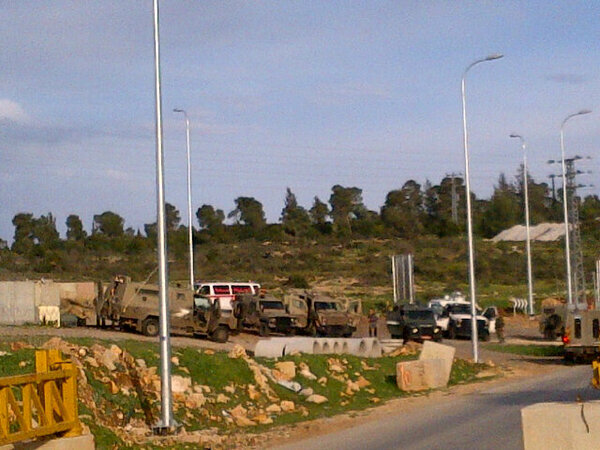 The Israeli military were waiting at the bottom of the road, blockading the access to the village. As soon as we were in range the tear gas started. A peaceful march met with poisonous tear gas from the very beginning. Many attempted to throw and kick the smoking toxic canisters away, but the sheer quantity meant we had to retreat quickly. As the smoke cleared, we tried to walk forwards once more. But then the unmistakable crack of live ammunition. We ran back. Without provocation, live ammunition was aimed at a group of peaceful protestors. Fortunately this time the bullet didn’t find a body, but the Israeli Occupation Forces lack of respect for human life is truly frightening. Two months ago four protestors were injured at this peaceful demonstration, adding to a long list of villagers who have been hurt or killed by Israeli military bullets whilst trying to fight for their rights. The army have been using live ammunition at this group of families and demonstrators more and more frequently during the last year. So the villagers’ weekly demonstration to struggle for their most basic rights – land and water – has been reduced to a short walk to become the target of bullets. Each week villagers risk their lives because they will never accept the theft of their land. Each week they are shot at because they want access to the spring which has been the source of life for their community for generations. 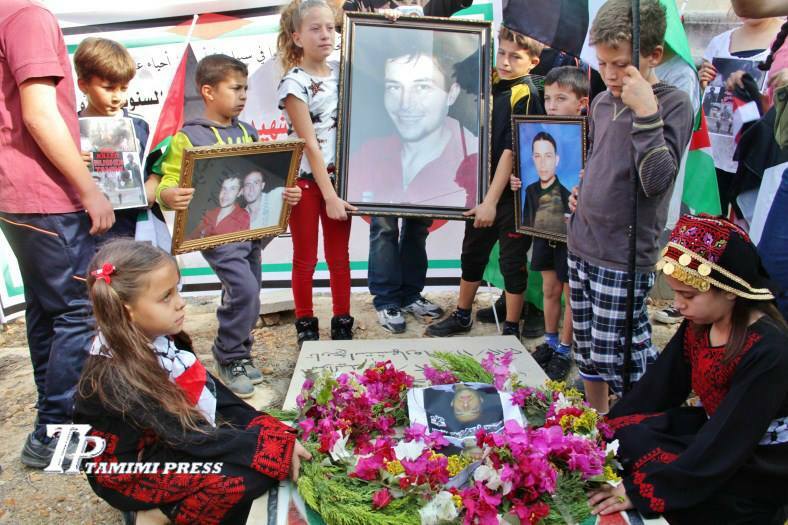 Nabi Saleh marks the 1 year anniversary of the murder of Rushdi Tamimi (31) by Israeli occupation forces. 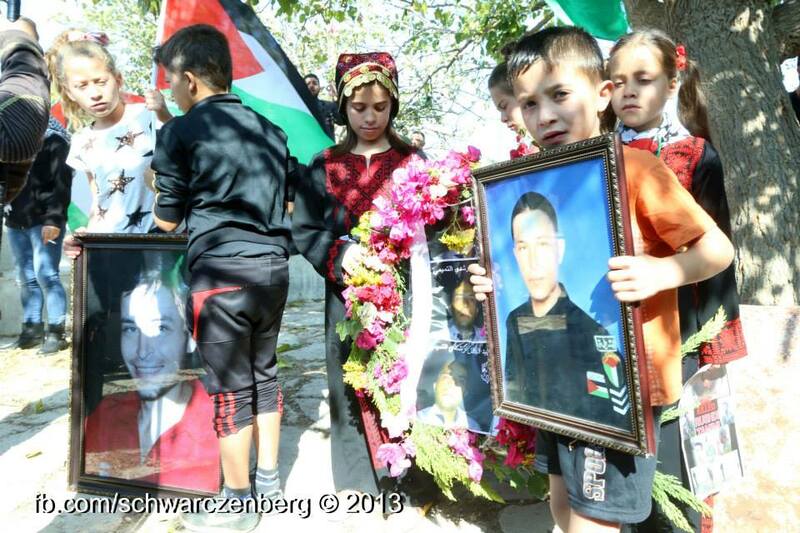 Rushdi died on 19 November, two days after he was shot by the IOF on his village land. An IOF probe concluded that Israeli soldiers fired 80 bullets without justification causing his death. 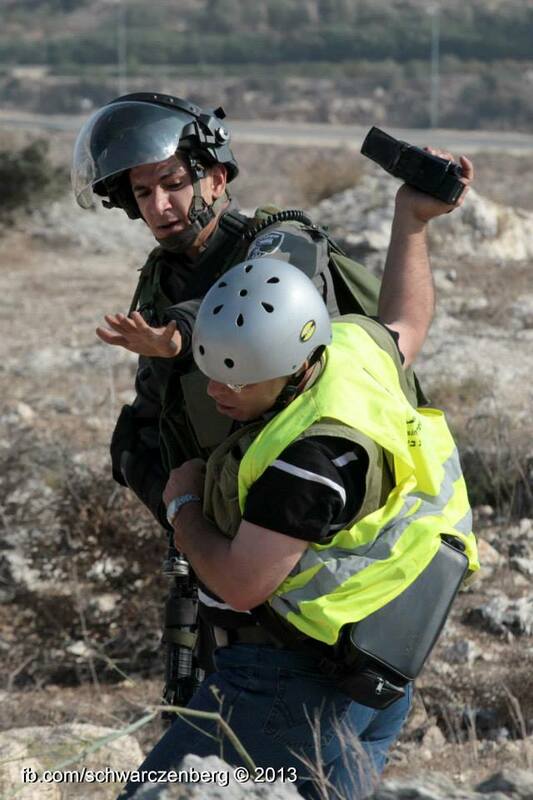 IOF injure and arrest 14 year old boy in Nabi Saleh; Spray pepper spray at video journalists. 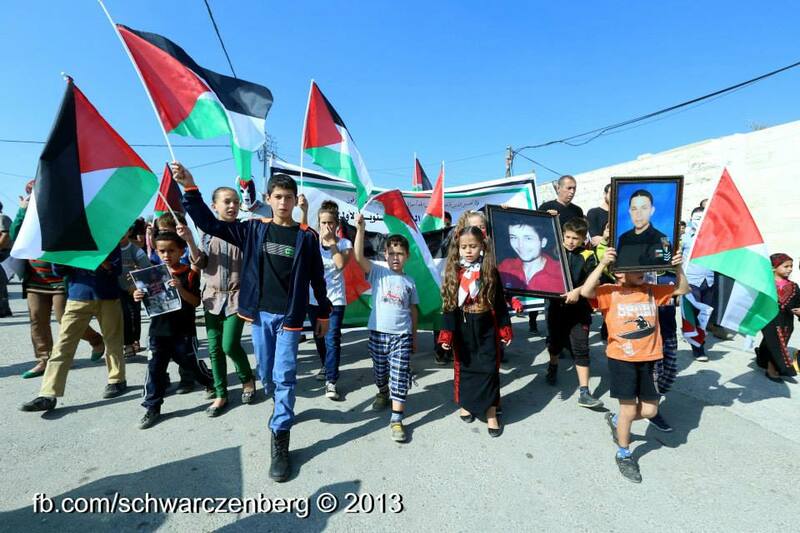 Today’s demonstration (22 Feb 2013) in NabiSaleh called for solidarity with Palestinian hunger strikers and Palestinian political prisoners. The demonstration saw protesters started to march towards the spring. Israeli Occupation Forces (IOF) invaded the village, accompanied by skunk truck and also began firing rubber coated steel bullets and teargas. 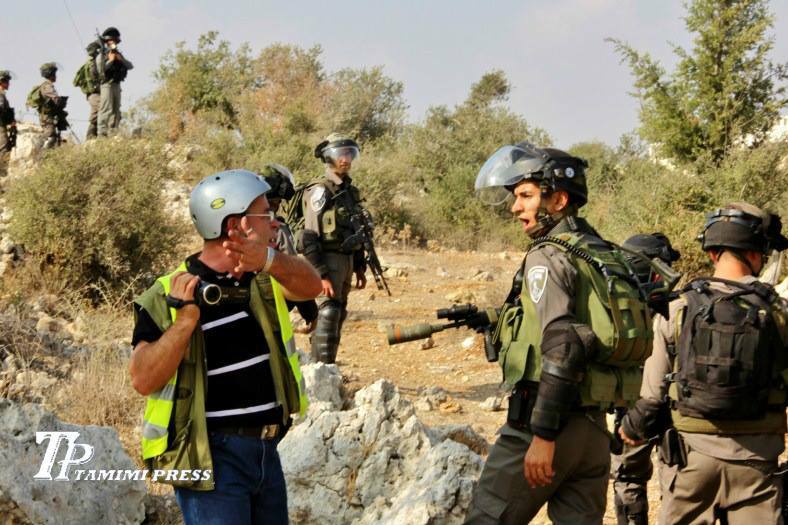 IOF have also sprayed local cameraman and videographer Bilal Tamimi with pepper spray as he was filming the demonstration. 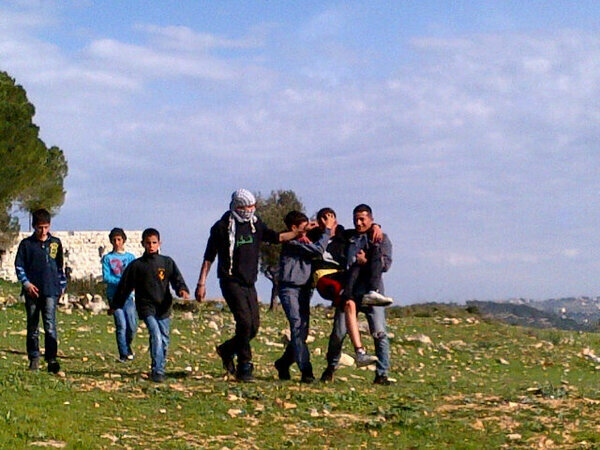 At least one protester received medical treatment after being hit by a rubber coated steel bullet fired by the IOF. A 14 year old boy was also injured by at least 3 rubber coated steel bullets and kidnapped by the IOF and taken to the check point tower has been evacuated to hospital in Ramallah. IOF and Palestinian ambulance at the tower checkpoint, preparing evacuation of 14 year old boy hit by 3 steel coated rubber bullets and arrested by IOF. 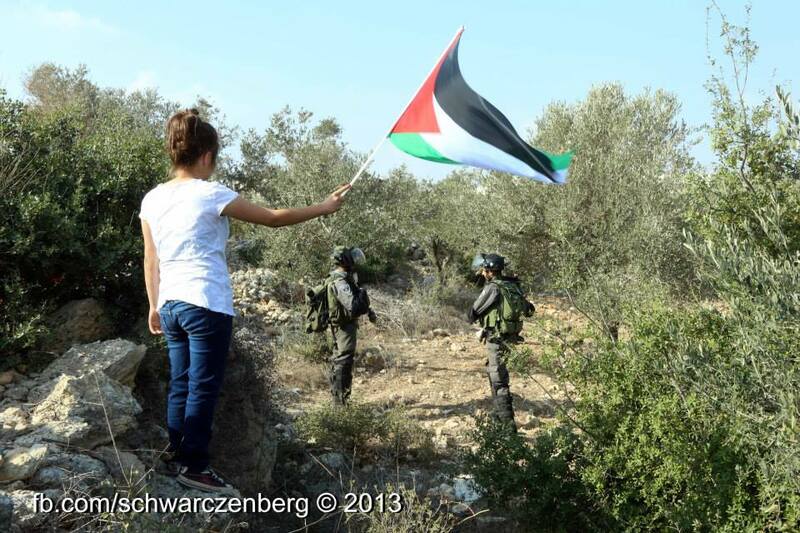 Photo by Tweet Palestine. Israeli Occupation Forces arrest Othman Bazzar from Ramallah. He was beaten and fainted. A Palestinian ambulance workers were able to eventually treat him. According to a report from an Israeli activist who was arrested at the same time, he was unconscious and the ambulance workers were not able to rouse him. He was then apparently taken to hospital (not sure where). Also arrested were two other Israeli activists and a 15 year old child from Beit Rima (next to Nabi Saleh) and another man from Beit Rima. Hilmy, one of the photographers for Tamimi Press was also shot at close range with two rubber coated steel bullets. Will update once again, when we have more information on Othman and the other arrests. 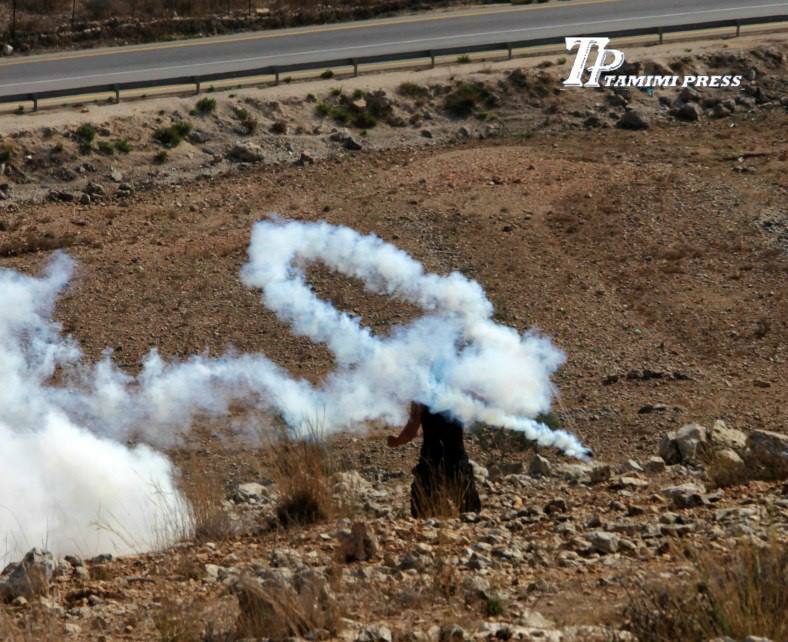 The IOF also sprayed “skunk” deliberately at Palestinian homes in order to try and intimidate village residents. Malek Tamimi, 22, was hit in the hand and waist. A second protester was shot in the head with a rubber-coated bullet; delayed ambulance entry to the village by an hour. Three Palestinians protesters were injured and 5 others arrested during the weekly demonstration in the village of Nabi Saleh. In order to prevent people from joining the demonstration, the Israeli army had set up checkpoint in all entrances to the village earlier in the morning. 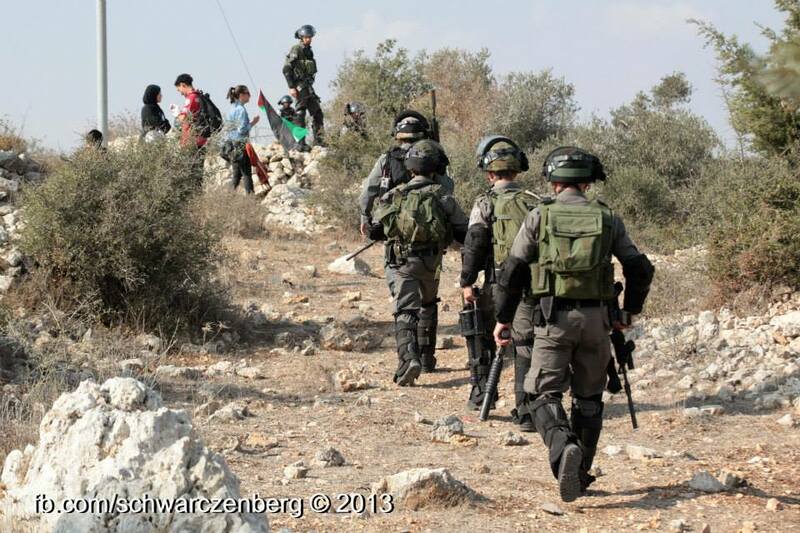 During the demonstration, the soldiers have arrested 5 people, including local cameraman, Bilal Tamimi, Bil’in activist, Mohammed Khatib, two female protesters and a journalism student, as they walked to the village’s spring, which settlers from the adjacent Jewish-only settlement of Halamish have been trying to take over for the past 3 years. In the afternoon, soldiers retreated from inside the village, adding the firing of live bullets to the assemblage of tear-gas, the foul-smelling liquid known as “the Skunk” and rubber-coated bullets used throughout the day. One protester, 22 year-old Malek Tamimi, was hit with a bullet that pierced through his arm and eventually lodged itself in his waist. Tamimi was evacuated to the Ramallah hospital where he underwent surgery. A second protester was shot in the head with a rubber-coated bullet and evacuated to the Ramallah hospital, where he received stitches. Yet another protester, a young woman, was hit in the leg with a tear-gas projectile shot directly at a crowd of people, resulting in a gushing wound. The woman’s wound could only be treated long after her injury, as soldiers prevented the ambulance from entering the village for about an hour. At 4.30 p.m., Malek Tamini was shot with a live bullet which went through his hand and the side of his body. He has undergone surgery for his injuries. One Palestinian suffered an open wound after being shot with a tear gas canister during protests. Soldiers were firing tears gas canisters directly in to the crowd with the intent of causing serious injury and then prevented the ambulance from entering the village for one hour . One local resident received stitches in Ramallah hospital after suffering a head wound from a rubber-coated steel bullet. 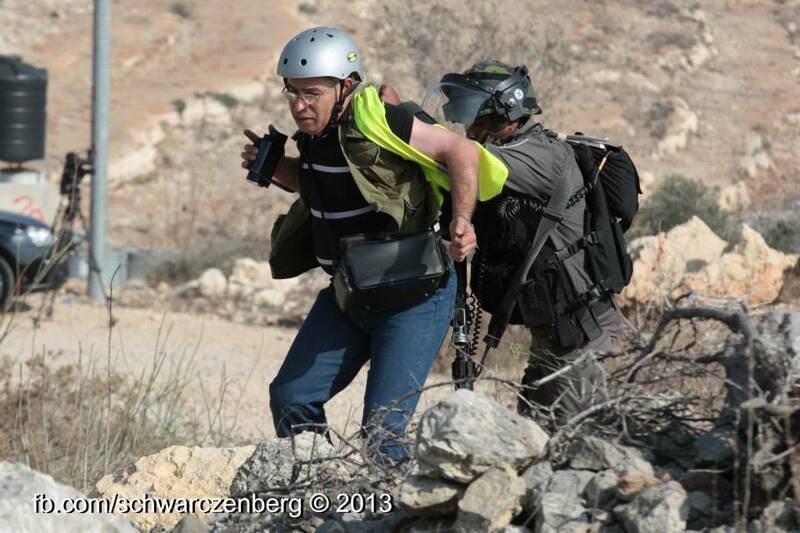 Three international solidarity activists were arrested during the weekly demonstration in Nabi Saleh this week. The army used anti-riot gear inside populated areas, shooting tear-gas canister and spraying “skunk” water into homes. 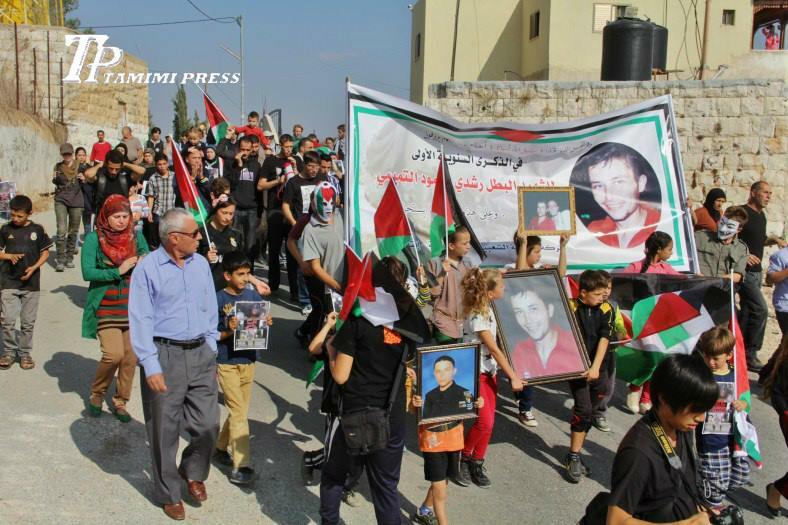 Dozens joined the weekly demonstration at Nabi Saleh this week, which marked 45 years to the “Naksa” – 1967 war which ended with the occupation of the West Bank and Gaza. Making its way from the center of the village towards the main road of the village, protesters were met by the “skunk”, a water cannon spraying foul-smelling liquid, and a volley of tear-gas canisters. As the demonstrators were dispersing and regrouping, soldiers marched into the village and started making arrests. Three international activists were detained on no grounds, only to be released at the end of the demonstration. The skunk truck also proceeded into the residential areas of the village, spurting the fetid liquid into homes for clearly no other reason than vengeance. A group of protesters who began making their way to the villages confiscated spring was attacked with a volley of tear-gas, fired from a launcher which shoots dozens of canisters at once. The demonstration ended with some clashes, however no serious injuries were reported.